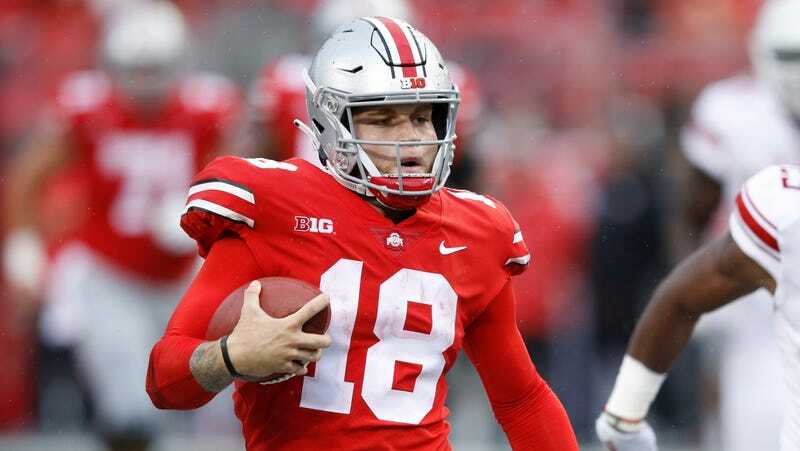 Ohio State quarterback Tathan “Tate” Martell has entered his name into the NCAA transfer portal. A photo of a computer screen circulated on Twitter with the Buckeyes backup’s full name highlighted, and the information was confirmed by Lettermen Row’s Jeremy Birmingham. While putting his odd name in the transfer portal does not guarantee he’ll be leaving Columbus next season, it’s still a slightly surprising thing for Martell to do given the situation he’ll be in next year and what he’s said. Dwayne Haskins had a monster season and became one of the top prospects for this year’s NFL draft—he even tweeted out a photo of himself photoshopped in a Giants jersey. His departure would leave Martell behind as the most experienced quarterback on the roster. More importantly, however, is what Martell said at the Rose Bowl this year regarding questions about former Georgia quarterback Justin Fields transferring to Ohio State. Fields would be the highest-rated prospect in the history of Buckeyes football, and his skillset and talent-level suggest he’d be the smarter choice to start at quarterback. Still, Martell “100 percent” guaranteed that he’d be the starting quarterback next year, and even downplayed rumors that he would transfer from the program. “I think [there are transfer rumors] because everybody has seen what I accomplished in high school and figured that I would want to get on the field, which I do. There’s no doubt I want to get on the field. But all that stuff is in the past. I want to play for Ohio State. It’s been my dream since I was born to play for Ohio State, and I’m not just going to walk away from something that I’ve put so much time into and there’s not a chance that I won’t go out there and compete and fight for my job. Martell made those comments before Fields’s transfer was official, but it still looks like his bluff was called with this decision. It’s not like Martell won’t have interested programs. Reports indicate Miami and West Virginia are interested in bringing in the quarterback who was more or less used in rushing and other Taysom Hill–like situations. The real losers of this situation could actually be Ohio State. Martell’s departure would mean the Buckeyes will seriously lack depth at quarterback. One unfortunate injury could send next year into a pretty bad tailspin and put coach Ryan Day in a position to explain why he let his most experienced quarterback go somewhere else. So, Who Will Be Ohio State&apos;s Quarterback Next Season?